Apple Music has been officially launched with the new iOS 8.4 update and anyone can access it, and yes you can access it in India as well! One of major announcements since it acquired Beats Music in 2014, Apple Music features a 24/7 beats live radio station dedicated entirely to music, which will be broadcast in over 100 countries. Apple is make things more attractive by offering a free three month trial for everybody and will only charge you starting from the fourth month, so there’s plenty of incentives to try out this service! The company boasts of a large music library and even has an exclusive track from R&B artist Pharrel Williams (Freedom). The service will cost Rs.120 per month for individuals and Rs.190 for a family of six sharing and it can be used across devices. So if you’re an Apple family, the family plan actually sounds like a good deal!! Apple will charge you from September once the three month free trial period ends. This is significantly cheaper than in the US, where an individual subscription costs $9.99 (Rs 635) and family sharing costs $14.99 (Rs 953). Apple clearly wants to lure in a large number of users with this new offering, thus explaining the low cost. The three month trial period starts as soon as you start using it and will require you to share your credit card details for auto-renewal of the service from the fourth month onwards. In India, however there are multiple alternatives when it comes to music streaming, like for ex. Indian music streaming service Gaana is much cheaper at Rs.99 compared to Apple. So if you’re not interested in continuing with Apple Music, you can disable it any time before the free trial is supposed to end. 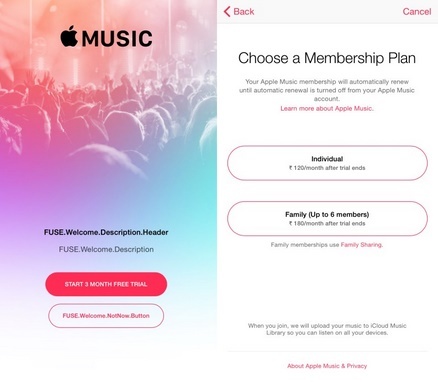 If you’re looking to turn off the renewal of Apple Music, it’s as simple as heading over to settings and turning off auto-renewal and you will be removed from Apple Music starting with the fourth month. The Apple Music catalogue will offer over 30 million songs and it says users can “stream any song, album or playlist you choose”. Users will also have the option of asking Siri to pick a song. Although Apple Music shows lot of promises, it’s still too early to judge it! Let’s wait and watch how things fall into places for Apple Music. Apple users go ahead and enjoy free trail at this link.